After seeing more than 92 million passengers in 2011, Atlanta’s Hartsfield-Jackson International Airport is the world’s busiest airport. With two terminals, six concourses, two different train systems, a consolidated rental car facility and more than 200 gates, travelers have a lot of ground to cover. When the airport’s new expansion opened on May 16, the airport grew to seven concourses, three main passenger entrances and three baggage-claim areas. The airport predicts 15 million travelers will pass through by 2015, due in part to the expanded capacity of the new $1.4 billion Maynard H. Jackson International Terminal. At such a massive facility, a smart digital signage solution goes a long way toward helping passengers find their way. For more than 30 years, the primary dynamic signage provider for Hartsfield-Jackson has been Atlanta-based Infax Inc. Infax has deployed more than 500 displays at the aiport for flight information, baggage directories, carousel displays, Customs and Border Protection queue management, public information, wait times near security checkpoints, TSA waiting area displays and roadside signage. Infax was founded in 1970 by David W. Davis, an electrical engineer who pioneered the display of text on traditional cathode-ray tube (CRT) displays. The company became a leading maker of CRT and LED displays for use in airports and other public spaces. With the rise of off-the-shelf plasma and LCD displays, the company closed down manufacturing and became a systems integrator, packaging computers, displays and specialty systems with its WinFIDS software for managing and displaying flight information. Today, Davis is retired, but his son Mike is the company���s CEO, and his grandson Bryan is a senior software engineer. The aviation industry is full of proprietary reservation systems, partial data feeds and legacy systems. Infax has developed database systems that interface with these disparate systems, which range from older serial data connections to Web-enabled XML data feeds. A recent airport trend is common-use systems, such as check-in kiosks, ticketing and gate computers, and displays for use by a variety of airlines. The airport assigns gates and check-in positions dynamically, and signage automatically updates to display appropriate back-wall logos, listings of carrier flights and flight-status information at the gate. Airports save money by eliminating hard signage, and digital signage offers the flexibility to quickly modify airline assignments as conditions change. One common-use system at Hartsfield-Jackson is WinFIDS, which exchanges information with the airport’s resource management system to assign gates and counter positions. WinFIDS combines information collected from centralized airline systems with data input by local airlines and airport personnel, the Federal Aviation Administration, third-party feeds and surface management systems. The technology provides a single face to the data flowing in from many different sources. Through WinFIDS, airport personnel can update flight and baggage information, display visual messages throughout their facility, manage ticket-counter assignments, customize page designs and manage user access to flight data. WinFIDS, in turn, can share arrival and departure information with aviation billing systems, the airport website, external services such as FlightStats.com, SQL reporting tools such as Crystal Reports, audio public address and other systems specified by the airport. 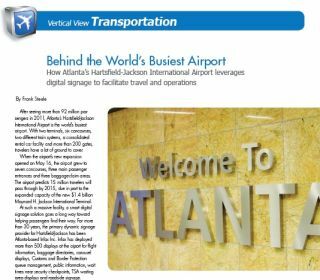 Hartsfield-Jackson’s new international terminal, also known as Concourse F, is the largest construction project at the airport in more than 15 years. The new terminal added 12 new gates and centralized international flights. The new facility separates arrivals and departures on different levels to streamline traffic and features a new Customs and Border Protection facility and two parking decks with more than 3,500 spaces. Infax worked closely with airport staff to ensure the new concourse met or exceeded the high expectations set by the flight information systems throughout the airport. The primary passenger-facing display is a Sony FWDS42E1, a 42-inch LCD that offers low power consumption, 1,920x1,080 resolution, and terrific display life and reliability. A variety of specialty displays take on airport-specific roles, including Daktronics LEDs at ramps and baggage-handling facilities and in an outbound bag facility, which are also driven by the WinFIDS system. These displays are invisible to passengers but are absolutely essential to managing the flow of baggage, fuel, catering vehicles and maintenance workers. Infax’s custom baggage claim input controllers were installed at the baggage drops for each carousel. The system combines a rugged industrial touchscreen computer running Windows embedded with Infax software that presents a list of arrival flights. With a touch of a button, baggage handlers can find a flight and activate baggage directories and the displays mounted at each carousel. After they’ve placed the last bag on the carousel, the baggage handler touches another button, triggering a “Last Bag” message that helps travelers know whether their bag missed their flight. At the Customs and Border Protection checkpoint, CBP personnel can manage traffic flow through overhead Samsung LCDs that direct particular groups of arriving passengers to the appropriate line. One line might be dedicated to diplomats and another to students, with CBP personnel updating assignments through a central workstation. The WinFIDS software runs through two primary file servers that employ Microsoft’s Windows Server operating system and SQL Server relational database. Databases on the servers are replicated throughout the day, and the servers are set up with automatic failover in case of a server component failure. Infax also provides round-the-clock tech support. Airports can not wait until the next business day when a server or key display breaks down. Infax techs can remotely access any computer in the WinFIDS system. The new facility is expected to handle nearly 3 million new international passengers a year by the year 2015, and eliminates a major headache that has dogged Atlanta-bound international travelers: The required re-check of bags after clearing customs. International arrivals in Atlanta will now be able to retrieve their bags after clearing customs and depart directly from the new Concourse F.
One expansion triggered by the new concourse will be installed everywhere else: 55-inch Samsung displays with embedded controllers and multilingual messages will help route passengers arriving on international flights in other concourses to Concourse F’s unified international baggage claim. Travelers who pass through the new concourse will encounter full-color outdoor LED signs that display short video snippets welcoming them and promoting the airport or local events. Curbside at the concourse, color LEDs will display airline logos at the drop-off point for each airline’s ticket counter. Digital signage has made the world’s busiest airport easy to navigate and manage.